The Saffron-headed Parrot (Pionopsitta pyrilia / Gypopsitta pyrilia) is native to the provinces of Zulia, Tachira, Merida and Lara in Venezuela; as well as the eastern slopes of the eastern Andes in Colombia north over northern Colombia to Darien in eastern Panama. Some populations may exist in Ecuador. Its numbers are declining due to habitat loss. They prefer subtropical or tropical moist lowland and montane forest areas. The Saffron-headed Parrot averages 9.5 - 9.6 inches (~24 cm) in length. The plumage is generally green, except the head and the throat that feature a bright yellow coloration. The ear coverts (feathers covering the ears) are washed with orange yellow. The breast and nape are olive-yellow. The thighs have some red and yellow feathers. The edge of the wings, the sides of the body and under wing-coverts are red. The primary wing feathers and wings are black - the latter with a bluish tinge and bluish-green edging. The lesser wing-coverts are green with a bluish tinge and the greater wing-coverts are blue with green edging. The central tail feathers have blue wing tips. The outer tail feathers have yellow to the inner webs. The irises are dark brown. The cere and feet are dark grey. Immature birds have greenish heads. 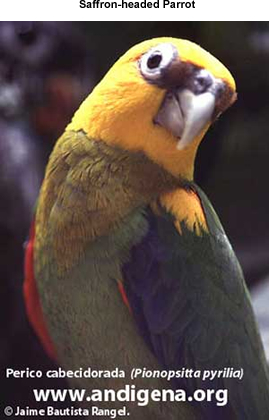 Their cheeks and ear coverts (feathers covering the ears) are tinged olive-yellow. The throat and breast are olive. The bend of the wing and wing-coverts are green with some red feathers. The edges of the wing are interspersed with green. The greater wing-coverts are green.